Actor Robbie Coltrane (Hagrid) has given a few new interviews while attending the London Film Festival for the screening of his latest movie, The Brothers Bloom. Empire Online has a brief video interview at this festival where he briefly mentions the upcoming Harry Potter and the Deathly Hallows movies. In the interview (approx 2:42 in) reflects on completing the series, and also says he has some fight scenes coming up, and is looking forward to his stunt scene on the flying bike, a Triumph 500. Please note at the beginning of the video you can see a short clip with actor Ralph Fiennes (Lord Voldemort) where he discusses some of the many films and great directors he has worked with in his career. Each Harry Potter film seems to get bigger and bigger. 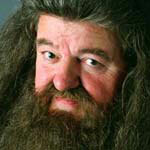 Robbie Coltrane: They were always written as another year in the children’s lives and they’re 17 now of course. So life has changed for them.